As a food blogger I do cook my own food and take pictures myself, that is what I love about food blogging. And of course on behalf of many other food bloggers I can say this too. This whole process we all like it until we cook something and definitely there will be a challenge waiting for us when the camera comes out of the bag !! Surely I found food photography a big challenge. Turns out making delicious food into a delicious picture is definitely not that easy ! Alright, there are many many talented and gifted food bloggers out there may not agree with me because they have 'magic wand' ! Somehow they can shoot and post anything and everything so presentable for us to see on the screen, that anything and everything that is brown and curries too ! I am not one of them, I am a novice in taking good pictures of my recipes and taking baby steps in this skill. Also with brown colour food ( most of the Indian food ) and with many curries I can't seem to make any of them look decent and worthy of their amazing taste. Curries, Sabzis and drink pictures makes me nervous, and definitely any eggplant or aubergine dishes always vexes me because of their brownness, and all the eggplant dish I love to have. 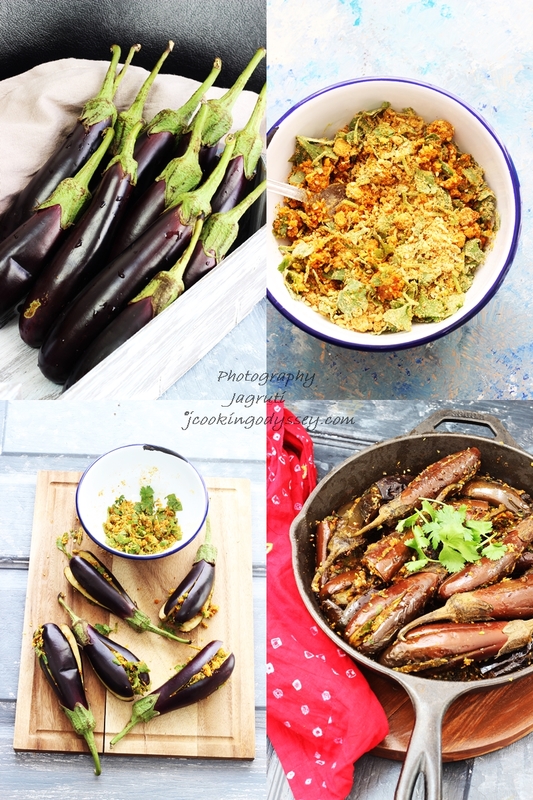 I cook numerous type of eggplant sabji and curries, think about blogging it and drop the idea of taking pictures as soon as dish is prepared. So why did I bother this time ? While I was cooking Bharela Raviya which is our family favourite, I thought when I search a recipe or going through someone's blog, I do not choose any recipe just because food picture is great. I always choose a recipe by an ingredients and method, not to forget that few decades ago most of the cookery books were without any pictures and still we learnt and cooked from it. 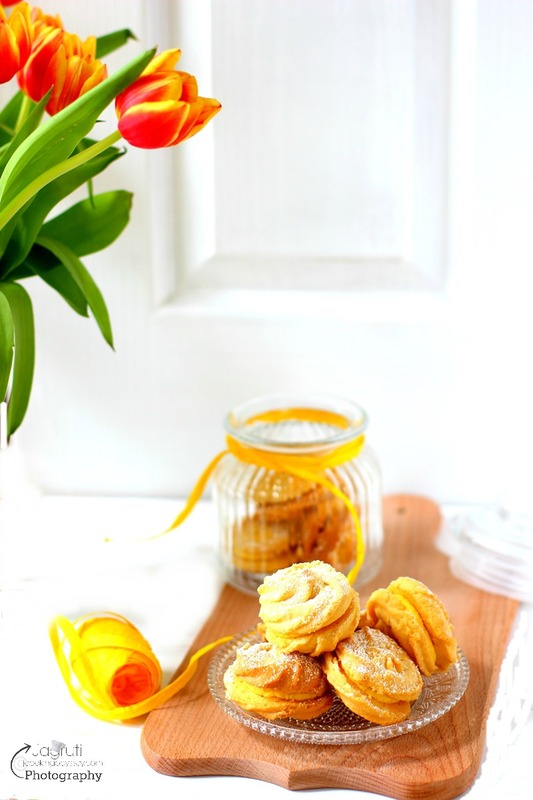 There are many food bloggers out there, may not own expensive cameras or lenses, but they have delicious recipes which actually you do have chance of making it in your own kitchen. So for that reason here I am with the dish which you can prepare this dish, I totally agree Stuffed Eggplants sabji doesn't look appetizing in a photo as it is on it's own. One day I might get lucky, till then enjoy this absolutely finger licking good and tasty Bharela Raviya !!!!!! Bharela Raviya is one of the authentic and unique Gujarati daily sabzi which is spicy and delicious. Once you prepared spicy and tangy stuffing with besan and various spices, it is one of the easiest dish to prepare. Bharela Raviya is a Gujarati dish, stuffed with delicious besan and spices stuffing. Roast besan on a very low heat til raw smell goes away. Transfer into another plate and let it cool slightly. Add all the other ingredients of the stuffing masala and mix well. Wash and dry raviya, cut them into cross slits, without removing segments . Stuff the masala into slit raviya. Add mustard and cumin seeds, once crackle add hing and gently put stuffed raviya one by one. Keep heat on LOW.Cover the pan with lid and let the raviya cook in the steam. Check after 10-12 minutes, gently rearrange them so they can cook other side as well. If masala gets too dry add very little water and cook on a very low heat. Occasionally turn them over and keep mixing all the masala with raviya. Cook till aubergine are tender and cooked through. Garnish with fresh chopped coriander and serve hot with paratha, Naan or Roti. Use lemon juice if amchoor powder is not available. This sabji can be prepared in pressure cooker with very little water til one whistle. Ginger-garlic paste can be added in the stuffing. Same stuffing can be used in okra, baby potatoes or onion.